Our good friends The Black Keys have released a video for the first single from their upcoming album El Camino, due Dec. 6. The video for "Lonely Boy" is simple, lo-fi, and pretty damn funny. 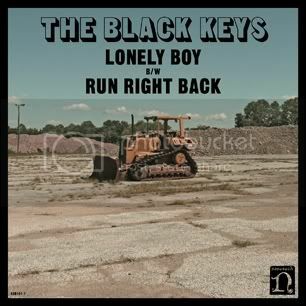 It's not groundbreaking in its concept but brilliant in its simplicity and execution, which describes a large portion of The Black Keys' catalog when you get right down to it. The tune is short and to the point and for the first 20 seconds or so, it sounds "... more straight ahead rock and roll- raw, driving, and back to basics" as vocalist/guitarist Dan Auerbach said it would be. It trades some of that edge for groove (adding some funky organ) as it unfolds, which is a shame only because that feedback-riff Auerbach is playing over a simple beat from Pat Carney sounds like the makings of a cool song- and it is, but not what "Lonely Boy" becomes, if that makes any sense to anyone other than me. I haven't heard anything else from the record yet but this is a good choice for a single based only on the premise an effective first single is identifiable without sounding tired or familiar. This sounds like a Black Keys song but I can't roll off seven of their songs it reminds me of. There have been many great records this year and there are many I'm still waiting to hear. Some clowns will have already compiled their 'Best Of 2011' list before El Camino comes out, and they'll be wrong to do so. I'm not putting it on my list without hearing more than one song, but I'm not making my list until I've listened to this many times over. "Lonely Boy" is available for download at iTunes you can pre-order El Camino there as well.